We brought out some of our shape cards and shape related school papers today. He's pretty good at his shapes and colors so we haven't brought out the shapes in a while. 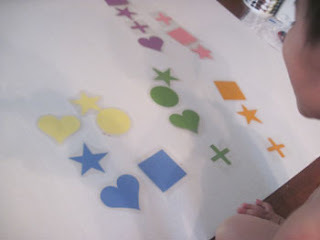 First we played with the actual shapes. 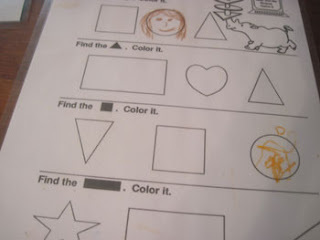 There are different shapes in each color so we first put all of the same shapes together, regardless of color. Then we arranged them according to color. He likes to make tracks, of course. As we arranged them I asked him periodically about a shape or color. I held up the "cross" or "plus sign" shape and asked him what it was. He said, "That's the church one. " After we did the shape pages I was doodling in one of the circles and asked him to draw Mommy. He monologues as he draws. Timothy: "Here's your eyes. Here's your nose. Here's your mouth. Here's your hair."